We only use the best components and materials in our Reyland brake kits. We use genuine Reyland or AP Racing rotors which have been heat treated to ensure the best possible resistance to warping. We also only use genuine AP Racing disc-to-bell fixings as they won't rust and they're stable under extreme heat ranges. The conversions listed below are direct bolt-on kits suitable for all Manta B models that have suitable sized wheels. The kits will also fit some other GM models from the same era, please call for more info. We can also supply other kits both smaller and larger to suit your requirements. The Reyland Track 330 front brake conversion features 4-piston AP Racing CP9200 calipers, two-piece 332x28mm Reyland discs and Reyland billet alloy mounting brackets and bells. The kit is supplied with all required parts including discs, pads, bolts, brackets and unions. 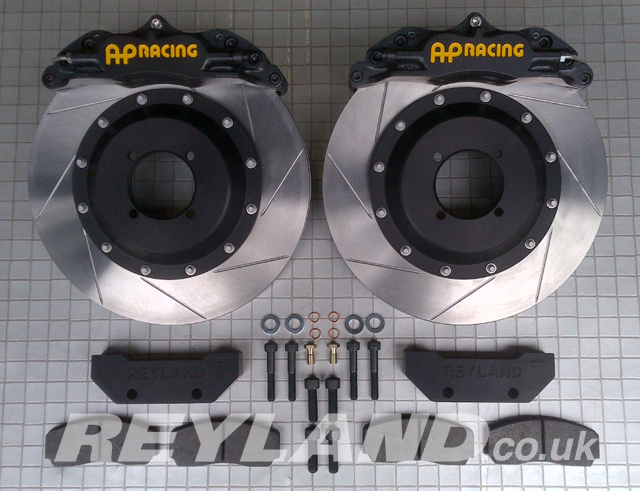 The Reyland Track 330 front brake conversion features 4-piston AP Racing CP9200 calipers, two-piece 330x28mm AP Racing discs, Reyland billet alloy mounting brackets and bells. The kit is supplied with all required parts including discs, pads, bolts, brackets, braided brake hoses and unions.